On a cruise, there are two very different types of days. The first is a sea day. These are the days when there isn’t a port of call — the ship is sailing to its next destination. The other type of day is a port day. This is when the ship visits a port of call and most people get off to explore. The truth is, the time in port is relatively short. On a 7-day cruise, you might have only three port days, and you may be docked for only eight or ten hours each day. In other words, on port days it’s a rush to make the most of your time ashore. One thing you might not realize, however, is that when you head to shore, you’ll want to bring everything you might need with you. Yes, the ship will be docked while you are in port and you can return at any time you want. However, on most excursions you can’t easily go back to the cabin. And even if you stick near the port, making the trek back down the pier, through security, and back to your room can take 20 minutes. In other words, you want to be smart about the things you bring with you on your port days. Below, we’ve featured nine different things you should never leave the ship without. Maybe it’s a big purse — or we suggest a lightweight backpack — but no matter what you bring, packing for port all starts with a bag large enough to carry everything you need. The key is to find a bag that’s large enough to carry everything you might need, but not so large that it’s a hassle to carry. We like bags that are made of lightweight material. These bags can fold down to take up almost no room in your luggage but open up to carry a ton. Even better, they quickly dry if they happen to get wet. Most people bring their actual passport into port with them. Personally, we would be more worried about losing the passport or having it stolen. That’s why we prefer to make a color photocopy of the front page (the one with our photo and passport number) and then taking that with us into port. This way, we have some identification with us while the actual document is stowed safely in the safe in our cabin. In the unlikely event that we need the real passport, we know exactly where it is. You don’t have to worry about leaving the ship without your room key. Modern cruise ships require you to scan the key to exit the ship. You’ll also need the key to scan back in when you return to the ship from port. Your room key is your most important item while on the cruise ship. Be sure to pack it with you and don’t lose it. 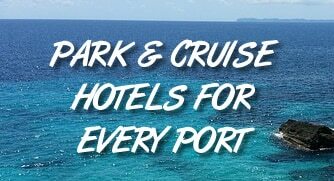 Many of the major ports like Cozumel will take credit cards, but you still want to bring plenty of cash with you into port. Credit cards aren’t accepted universally — especially in smaller ports. As well, it’s nice to have cash for tipping and you also don’t need to worry about your card be compromised. So how much cash should you bring to port? That depends on how much you like to spend on souvenirs, meals, and the like. For most people $100 per person in assorted bills should be plenty, unless you are a big spender. It doesn’t matter if you are headed to the beach or to the wilderness of Alaska — you need to pack sunscreen with you. This isn’t just the same old medical advice about the damaging effects of the sun. It’s about enjoying your vacation. In many places, especially the Caribbean, you can burn in as little as 15 minutes. If you are out for an extended period of time and receive a bad sunburn, it can ruin the next several days. Instead, just do the smart thing and pack sunscreen, reapplying every couple of hours. Just like sunscreen, a wide-brimmed hat should be a requirement any time you step off the ship. With the sun bearing down, the best remedy for sunburn is to not get burned in the first place. A hat keeps the UV rays off your sensitive head and face altogether. Not to sound like an overbearing parent, but wear your hat. If you’re headed out on an excursion, be sure to pack a water bottle with you. Even just sitting on the beach you can sweat in the heat and humidity. It’s easy to be dehydrated without even realizing it. Just bring a water bottle and keep it filled with water from a known source (like the ship). You can also just fill it with ice so that you always have some cool to drink no matter how long you are in port. It’s a good idea to wear comfy walking shoes when you leave the port. They can keep your feet protected and are much more comfortable than wearing flip flops. That said, you should always pack a spare pair of flip flops in your bag. Not only are they great for the beach, but if something were to happen to your walking shoes, you have a backup until you get back to the ship. Maybe it’s a watch, or maybe it’s just your phone. No matter what you bring, you should always have some way to keep an eye on the time. Ships run on a tight schedule and it’s not a myth that passengers have been left at port for arriving too late. Get a clock and don’t lose track of time, no matter how much fun you are having. Have something else that you always bring to port? Let us know in the comments below.